Joaquin "El Chapo" Guzman has done it again! He's escaped from the high security prison in Altiplano, through a tunnel. Several prison workers are being held. The tunnel was built from a 50 centimeter hole in the shower. It then widened, and extended for a mile. It was about 33 feet deep. President Nieto is in France, and his Administration will be very embarrassed by this. 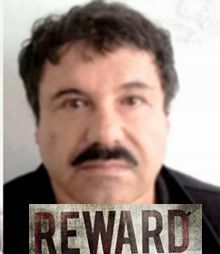 The Mexican Army announced tonight it has captured the chief security guard for Sinaloa cartel leader Joaquin "El Chapo" Guzman. The army will name and "present" him to the media tomorrow. He was captured in Culiacan.